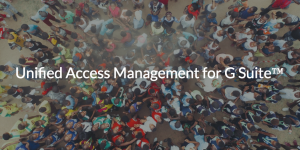 The concept of unified access management is one that’s being discussed by analysts and vendors a lot lately. The concept has largely been focused on just web and on-prem applications. However, what is interesting to many of today’s IT admins is an extension to this concept: how to center unified access management for G Suite™. In a sense, what IT admins are looking for is not just unified access to applications. They are looking for the ability to give an identity access to whatever that user needs. This includes their systems (Windows®, Mac®, Linux®), cloud and on-prem servers (e.g. AWS®), physical and virtual file servers (NAS appliances, Samba file servers, Dropbox™, etc. ), as well as wired and WiFi networks. Even more so, an ideal set of credentials is one that the end user could leverage with their G Suite account. G Suite is arguably one of the most popular web application services being utilized by businesses today. With it, organizations can use email, calendar, productivity solutions and more, all of which are working in conjunction. What’s more, with G Suite, users can operate inside of others’ documents to facilitate group work and editing. Despite all these features, Google has a limited approach when it comes to how organizations can leverage their G Suite credentials. Both Google Cloud Identity and G Suite Directory focus on managing user access to other Google services and a few select web applications. On-prem applications, on-prem file servers, networks, and systems are left out of the mix largely by design. If you step back, this makes sense because Google’s approach to G Suite was never to create a Microsoft® Active Directory® (MAD or AD) replacement, but rather a complement to AD. Their primary goal was to encroach on the monopoly that Microsoft had built with their Office suite. Microsoft, of course, isn’t interested in playing second fiddle to Google, so they won’t take G Suite credentials and federate them to other IT resources. And, vice versa, of course. Office 365 credentials are simply identities hosted within Azure® Active Directory, and similarly to G Suite, those credentials are designed for use on Azure and a select number of web applications. But, for IT organizations and end users, the idea of leveraging G Suite credentials for a wide variety of IT resources is interesting and intriguing. The good news is that a new cloud identity management platform is enabling the unification of access to IT resources with one set of credentials, and those credentials can be the same as those used for G Suite. Called JumpCloud® Directory-as-a-Service®, this modern approach to directory services is securely managing and connecting users to the IT resources they need, including systems, applications, files, and networks regardless of platform, protocol, provider, and location. The best part is that through tight integration with G Suite, this modern IDaaS solution can become the authoritative identity provider integrating G Suite credentials to virtually all of a user’s IT resources. To leverage unified access management for G Suite via JumpCloud Directory-as-a-Service, you can sign up for the SaaS solution today. Signing up is free of cost, and the first ten users in your organization are on us. If you are unsure if JumpCloud Directory-as-a-Service is the right solution for you, schedule a demo to see it in action, or contact us to ask any questions you might have.